With a fine premise and likeable main character, this one still doesn’t hold up for the whole way through, due to not caring so much about the players or the team. This is an okay movie. It starts out pretty great, but then loses steam more and more as it goes on, to the point where the second half is a definite plummet from where the first was. The humor is strong for a while, and the premise is pretty good. This is a movie about a bouncer turned hockey player, simply because of his fighting skills. He doesn’t know the first thing about playing hockey, but is sure good at being the muscle on the team. The problem is that the film dives into way too many storylines and then gets lost in each one of them, not carrying them out to the level that would make us actually care. The thing about Goon is, it’s a movie about a hockey fighter. Not a hockey player, but a hockey fighter. 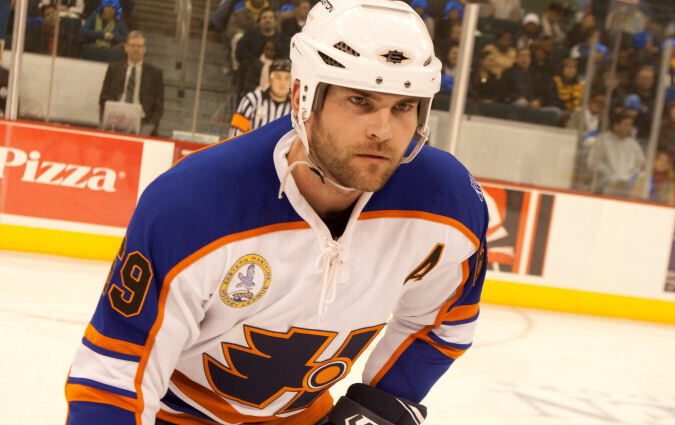 This guy, Doug Glatt, (Sean William Scott,) starts the movie off as a bouncer at a bar, and ends up on the ice in what is sup’posed to be a competitive movie about winning hockey games. Only Doug doesn’t really help win the games. He certainly doesn’t know how to play hockey. He’s there to do one thing only. To fight. Doug has some special fighting ability, some special strength and resistance when getting hit, that makes him almost like a superhero. There are multiple scenes where he gets hit by much bigger guys, and the hits do little to no damage. In fact, if anything, they hurt the guys who are hitting him. Doug uses these skills to join a hockey team and become the muscle. His job is to protect the other players. This makes for an interesting enough premise. But does it hold enough water to last for an entire film? The answer is no. Here’s a movie that is far better in its first half than it is in its second half. Maybe that’s because the path that leads to him playing hockey is much more interesting than the act of him playing hockey itself. Or maybe it’s because we just get kind of tired of this guy and this situation the longer the movie goes on. It is, after all, built on some very thin story ideas. Doug as a bouncer, at the start of the film, has to deal with a lot of crap, including being a sort of leg-breaker who beats guys up that owe money, in alleys. Doug has a friend, named Pat (Jay Baruchel,) who has his own sports talk radio call in show, and Pat is absolutely hilarious. He curses and screams at callers, and isn’t afraid to be crazy and over the top at all times. Pat is by far the funniest character in the entire movie, and the more we get of Pat, the better. Unfortunately, his character is primary in the first portions of the film, and then barely appears after that. When he does show up, in later scenes of the movie, it’s just in the hockey stands, as a barely noticeable part compared to what is actually taking place on the ice. This is unfortunate. Doug gets the call from a hockey manager after he is witnessed getting in a fight with another hockey player, while in the stands of a game. Doug’s brother is gay, and Doug takes offense to anyone using homophobic slurs, even if the terms are being used not against gay people, but simply to insult someone else. Doug’s response is always, “my brother’s gay,” and then he goes to beat the guy up. This goes well with Doug’s character, which is a simple-minded nice guy. Nothing more. When he gets on the ice for the first time, wearing figure skates, the teammates laugh at him. Doug’s response is to just beat them all up. Once he starts playing hockey, the movie breaks off into three new storylines. The first involves the girl who Doug starts seeing. Eva (Allison Pill,) seems like a nice, wholesome girl who is really into Doug. She admittedly sleeps around, but there’s a certain charm to the way she admits this, and knows that it’s something about herself she wants to change. Everything is great between her and Doug except for one problem. She has a boyfriend. One who she is semi-serious about to the point of not wanting to break it off so easily, despite her feelings for Doug. This leads to a couple of interesting scenes, like one where both Eva and her boyfriend come to watch Doug play a game, with the boyfriend having no idea that Eva even knows who this guy they are watching is. The second storyline is about a player who has lost his confidence. This is the reason why Doug really gets hired for the team. There’s a certain player on the team who was apparently pretty great. He was the superstar of the team. But then something happened. He got checked in a game really hard, to the point of needing to be in the hospital and out on disability. When he finally did recover, and got back to playing hockey, things weren’t the same. He was too afraid of something like that happening again to take the same kinds of chances he used to take. Doug was hired to help protect this guy, and help him get his confidence back. This is an interesting story, but it never pans out. We don’t really get results here, and this is a case of all setup and no follow-through. The last story is about the sort of rivalry between Doug and Ross Rhea (Liev Shreiber.) It’s not really a rivalry in the traditional sense. These guys don’t hate each other and don’t have any bad blood from the beginning of the film, the way most rivalry stories do it. Instead, this is more of a case where Ross Rhea is a legend in the hockey fighting world, and he has been known in the area for years. Now he is on the verge of retirement. That’s when Doug comes into the league. And everyone keeps asking Rhea about Doug and vice versa. People want to see the two of them take each other on. One night they even meet in a bar and sit down for a conversation, long before they ever actually meet on the ice. This is a storyline that works, in everything they are doing, but even still, it’s not like we really care. They’re telling us that this guy Rhea is a legend and that we should care about him fighting Doug, but do we really? Like most things that happen in the second half of the film, this storyline falls a little flat. The problem with Goon is that it’s all over the place. It’s the story of the hockey competition (helping the player find his confidence,) it’s the story of the hockey fighters, it’s even the story of a romance and girl who has to break up with her boyfriend in order to date Doug. Most movies are a combination of different storylines, but the case of this film, it almost feels like they believe if they can spin enough stories all at once, then it will distract us from the fact that none of the stories are really very good. As a result, lots of these stories get started on the right foot, but then lose their ground and get lost in the mix as the movie goes on. Goon is a movie that has developed a cult following, to the point where there is a sequel on the way out, which features all of the same cast, and then some. Considering that there were definitely some interesting ideas here, that just weren’t handled so well, this is news of a sequel is a good thing. Maybe if they get one more crack at it, things will be a little better. Maybe if they focus more on the individual stories and carrying them through the whole way, then it will make a big difference. To that extent, let’s hope they reduce the number of stories in order to make each one a little stronger. And let’s also hope that the Jay Baruchel character is given a bigger part, considering that he was absolutely the best thing about this film.